2010 marked the 200th anniversary of the birth of the great Romantic-era composer Robert Schumann. Schumann was perhaps the archetypal moody artist, alternating between blazing bouts of creativity and periods of antisocial depression. It’s a common cliché that has, all too often, been sustained by sad life stories punctuated by tragic endings. 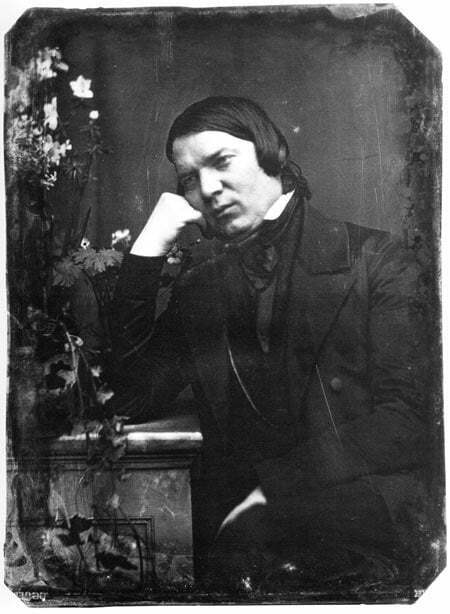 Schumann died a broken man in an insane asylum. More recently, we’ve seen gifted musicians like Kurt Cobain and Elliott Smith take their own lives after struggling with depression. There are many, many others who fit the cliché (Tchaikovsky, Billie Holiday, Joy Division’s Ian Curtis…the list goes on and on). Why are there so many artists and musicians that struggle with depression and other forms of mental illness? I can’t be absolutely certain, but I’d be surprised if Schumann, Cobain and Smith weren’t at their happiest when they were writing and playing music. We’ve all experienced a moment in our lives when music has helped us get through a rough patch; when listening to or singing a particular song has just seemed to simultaneously hurt so good and help mitigate the pain. Is it also possible that, for Schumann, Cobain and Smith, music was almost like self-medication, a treatment for their mental ailments? I put together a short musical essay about music and mental illness that first aired on CBC Radio 2’s In Concert on Sunday October 24th, 2010. For info on all the music I used in the piece, please look here and scroll down to the list of musical works. These days my tinnitus is pretty bad. It’s a ringing in my ear that I notice most frequently at night, when all else is quiet. It used to be just in my left ear, but lately my right ear has been acting up. Recently I wrote about how tinnitus has altered the way I think about noise, and about silence. You can read my thoughts in Issue # 2 of BoulderPavement, the Banff Centre’s new online literary journal.